For when you're willing to go the extra mile! (SPOT.ph) If you want to spice up your next Sunday brunch date with your special someone, we’re pretty sure you’re both going to love the thought of a road trip. Lucky for us, nearby towns and cities about an hour or two away from the bustling Metro have their fair share of restaurants and cafés to make the trip more worthwhile. So next time you’ve got a special date planned, dress up and hit up these romantic restaurants that are worth the drive. The Pinto Art Museum isn’t the only thing you should look for in Antipolo. 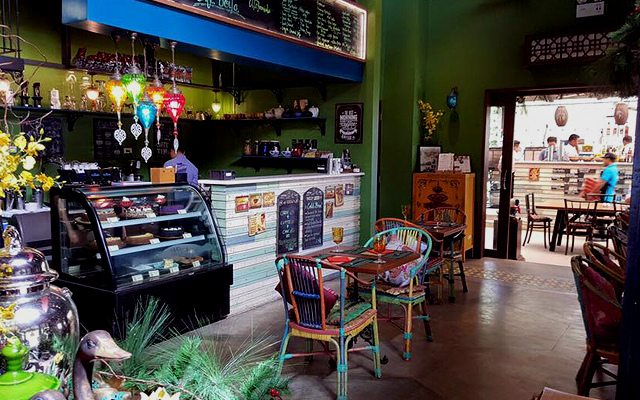 There’s also the Antipolo Beehouse and its hidden surprise: Burrow Cafe. The place is a cozy nook that’ll make you think you have your own secret garden. Come when the weather is pleasant enough, and you might be lucky to dine with the tall windows wide open, letting in the cool mountain breeze. Plus, the menu is enough of a reason to come visit. They have all-day breakfast options like Tender Beef Tapa, and some mouthwatering lunch items like the Short Ribs with Risotto. Be sure to call in advance as dining is by reservation only. Burrow Cafe is at 113 Beverly Hills Avenue, Beverly Hills Subdivision, Taytay, Rizal. 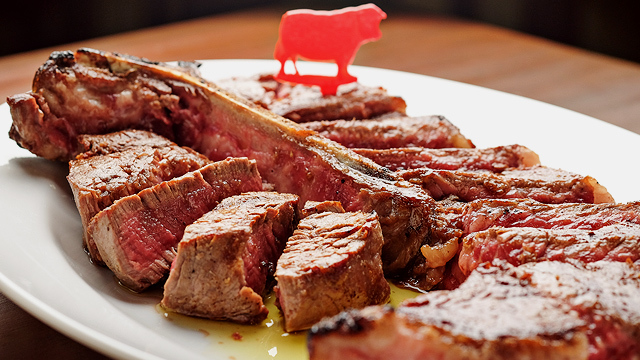 Vieux Chalet is a homey Swiss restaurant that’s well worth the hour-long road trip. Just stepping inside feels like a breath of fresh air with the well-lit interiors and bright, sunny decor. 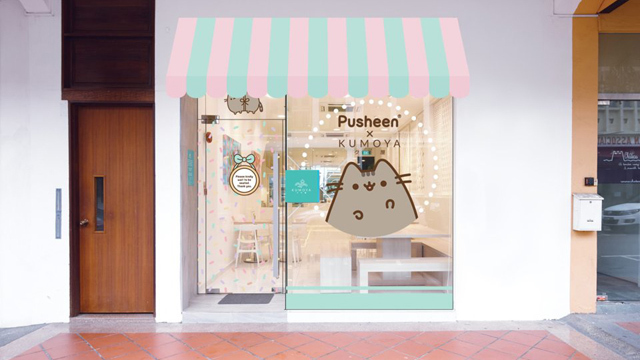 Other than a completely IG-worthy space, the restaurant is also sure to be a delight when dining in. Their Swiss Platter is a great crash course in homegrown Swiss specialties, while their take on the Italian classic, Osso Buco, is worth your every buck. 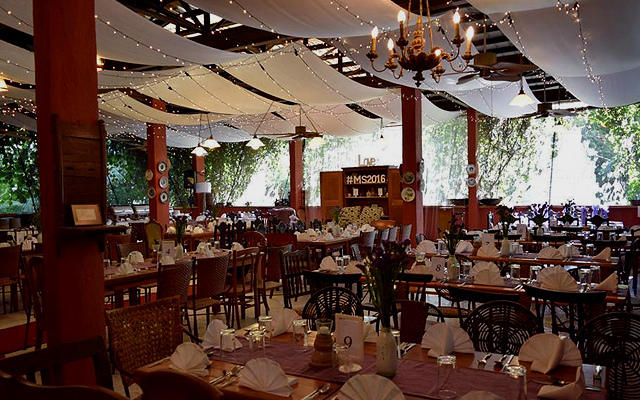 Vieux Chalet Swiss Restaurant is at 456 Taktak Road, Sitio Sampaguita, Barangay Santa Cruz, Lower Antipolo, Rizal. It’s hard to find anyone who’s made the trip to Tagaytay to dine at Antonio’s and didn’t love it. 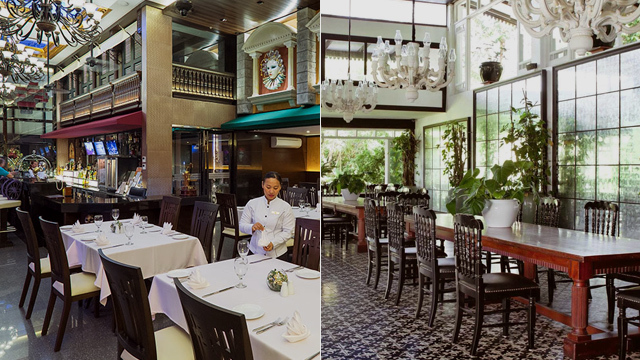 The restaurant boasts different dining galleries and areas—some even al fresco—but no matter where you decide to sit, you’re still sure to be surrounded by the elegant, romantic décor. Pro tip: You’ll want to come at night to see the place all lit up! The food is not to be outshone though; may we recommend their special Roasted Duck Breast? Antonio’s is at Purok 138, Barangay Neogan, Tagaytay City. At first glance, Marcia Adams will remind you of a little cottage in the woods—but a fancier, more leveled-up one. With bouquets of flowers on every table, the kitchen counters, and even the display shelves, it’ll feel like you’re celebrating Valentine’s Day no matter when you visit. Their Italian Pork Chop is a popular treat among meat lovers, but the Fish Souvlaki, their catch of the day marinated in olive oil, lemon, and herbs, is a must-try, especially if you lean more towards seafood. Marcia Adams is at J. P. Rizal Street, Alfonso, Cavite. Cafe Voi La is known for their eccentric but vibrant décor with a bright yellows-reds-and-blues color scheme that shouldn't work but does, so it’s sure to add that celebratory feel to any dinner date. Everything in the restaurant has some Asian elements to it, particularly Vietnamese, so you can expect a lot of Filipino and Asian fusion dishes on the menu too. Their version of Homemade Chicken Pork Adobo will taste just like home, and an entire section dedicated to all-day breakfast. 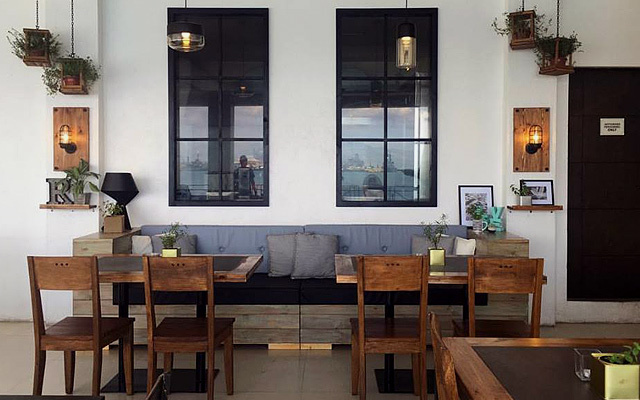 Cafe Voi La is along Calamba Road, Tagaytay City. 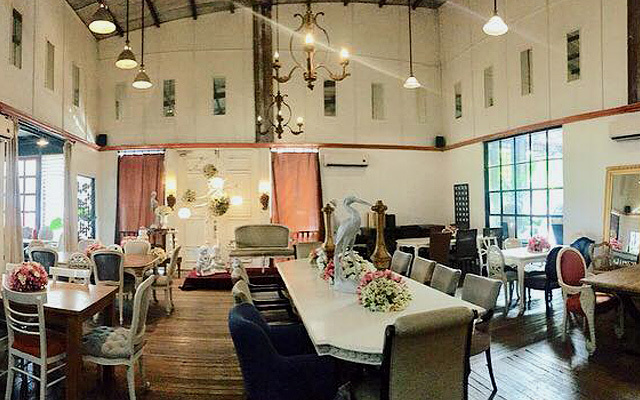 Souq’s warm and pleasant atmosphere makes it a great dining destination when you’re in Pampanga. The interiors are dainty and elegant, with a lot of light streaming in through the big windows. They have an extensive menu for you to choose from, too, so you and your date will never go hungry. Their Classic Bulalo Soup deserves praise; don’t pass up the chance to try their Garlic Pepper Beef Salpicao while you’re at it. Souq is at Lazatin Boulevard, San Juan, San Fernando, Pampanga. Tahanan Bistro used to be a family home but was later turned into a restaurant that’s a little paradise away from the big city. Stone steps with preserved woods railings lead you from the garden to the house, where even more surprises await like a mini gallery featuring works collected by artist and owner Benji Reyes. And when you dine in, you’ll be treated to curated set menus that revolve around local produce. Try the Arayat Set for something fresh yet filling, with Hipon (prawn & pumpkin ravioli with coconut cream), Humba, Lumpiang Ubud, and dessert. Tahanan Bistro is at 22 Loresville Drive, Lores Farm Subdivision, Barangay San Roque, Antipolo, Rizal. Your inner boho-loving self will thank you for making the drive to Chateau Hestia. 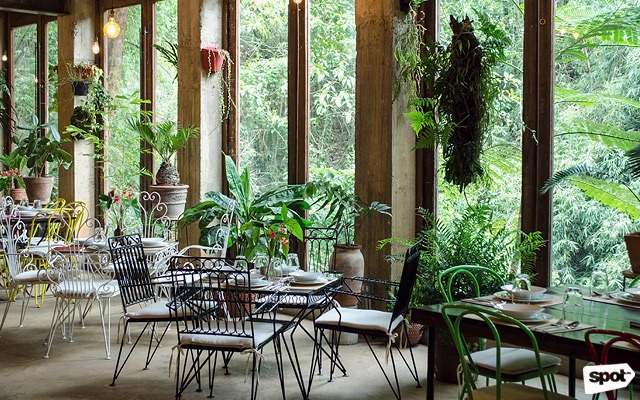 The woven furniture and big green plants give the place a tropical feel. Their Cheese Board makes a great appetizer and mood-setter, which prepares you for their more filling entrees like the Kummel Braten, or a tender roasted pork belly served with bread dumplings and sauerkraut. Also, you might want to stay for some dessert—don’t miss the panna cotta. Chateau Hestia is at J. Hernandez Street, Purok 5, Barangay Bukal, Silang, Cavite. 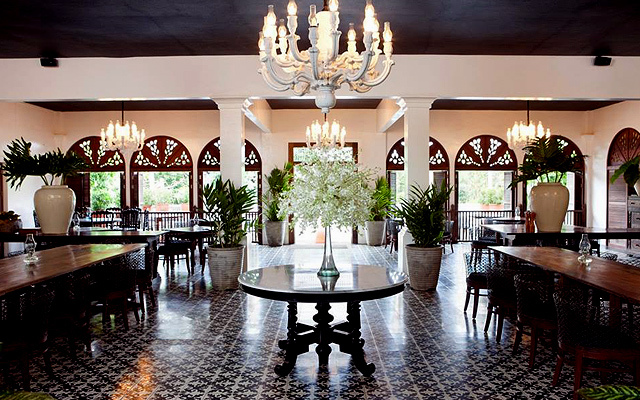 Piccolo Padre is a beautiful restaurant that deserves your attention next time you’re headed to Pampanga. Romantic chandeliers hanging from the ceiling will tempt you to come in for dinner. Paintings and art lining the walls give Piccolo Padre a palatial vibe. But of course, since you are in a restaurant, you’ll want to feast on some of their specialties, like the creamy and indulgent Foie Gras & Marrow Saffron Risotto or Maine Lobster Tails. Piccolo Padre is at Prime Asia Hotel, Narciso Street, Angeles City, Pampanga. Rali’s Restaurant treats you to a beautiful view of Subic; we have to emphasize that you have to plan your trip in time to see the sunset. Simply decorated, the entire restaurant has a laid-back vibe, you might end up feeling like you were in a beach house instead. The food also makes the incredible ambiance even more worth the trip: the Stuffed Bacon-Wrapped Chicken and the Babyback Ribs both sound like a meat lover’s dream. Rali’s Restaurant is at Malawaan Park, Subic Bay Freeport Zone, Zambales.